Well it’s that time of year again… my son Cormac’s birthday. Cakes are expected and time always seems to be short. I always end up rushing his cakes for some reason. So this time, I decided to try and come up with a design that would be easy to put together last minute and this one worked! I’m normally a one cake a week, kinda gal. But this week I had 4 cakes to do!! That may not sound like much to some of you. 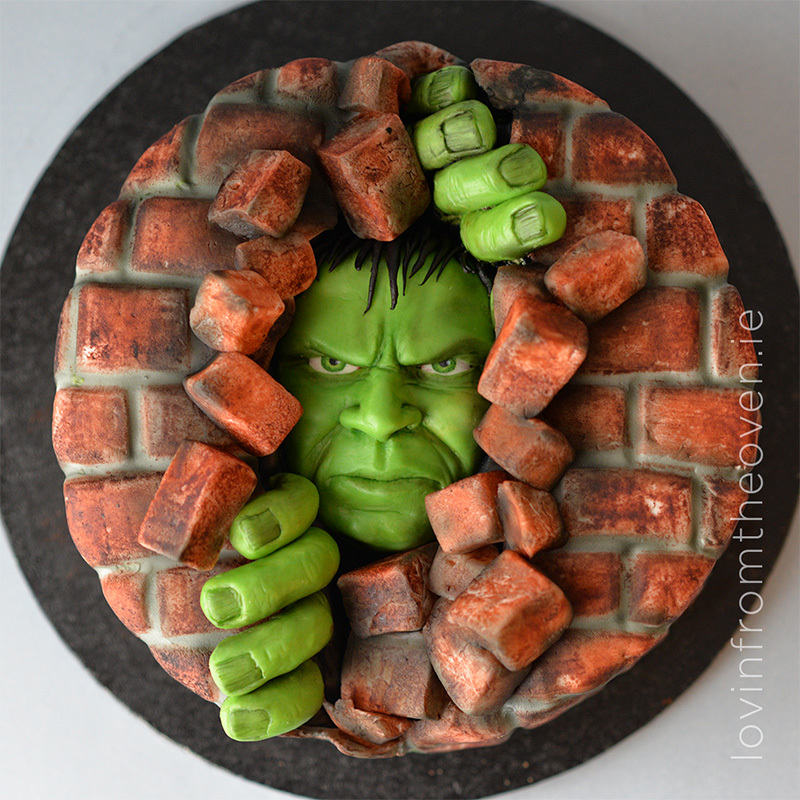 I’m always amazed at people who can whip out 15 immaculate cakes in a week. But that’s just not me. So I had to make as much as possible in advance. Five days before the big day, I was able to model Hulk’s face and hands, using Vera Miklas modelling chocolate, some Cerart and some Sugar Shaper modelling tools. I also did a little dusting and painting on him to add some depth. This way, when I made the cake itself I could just ‘insert’ them in. There was going to be a bunch of 5 year old boys with grabby hands there. So I didn’t want to use any toothpicks or anything that they could choke on (or use as a weapon). Safer all around to keep it as a ‘flat cake’!! I’m all about hidden candy in the cakes for my kids. And this one was no exception. Under the Hulk’s face I used a thin cake card to make a tube to hold up his head securely and also to keep the candy inside nice and dry. I cut out a circle of cake from the base layer and popped in my secret candy compartment. 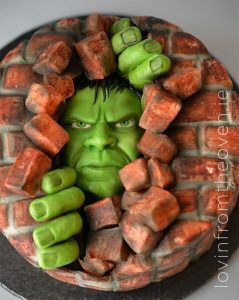 I carved out a rough and jagged ‘crevice’ from the top layer of the cake to go on either side of his head to build that wall. After icing and covering it with white fondant, I placed in the head and started making the indentations of the bricks using a sugar shaper. I was tempted to use my brick impression mat, but the bricks on mine were too small! After marking the bricks out, I pressed crinkled tin foil on them to give them a rough texture. With a soft (clean and new) sponge I dabbed each brick with a mix of terracotta petal dust and some vodka… after all, this is a party 😉 . 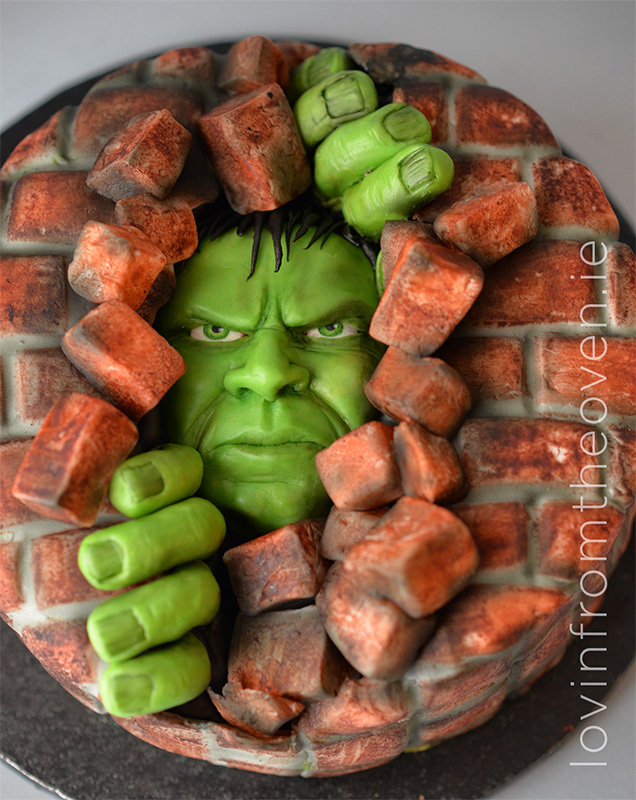 Once it had dried a bit I placed in his fingers at an angle to look like he was pulling the wall/cake apart. 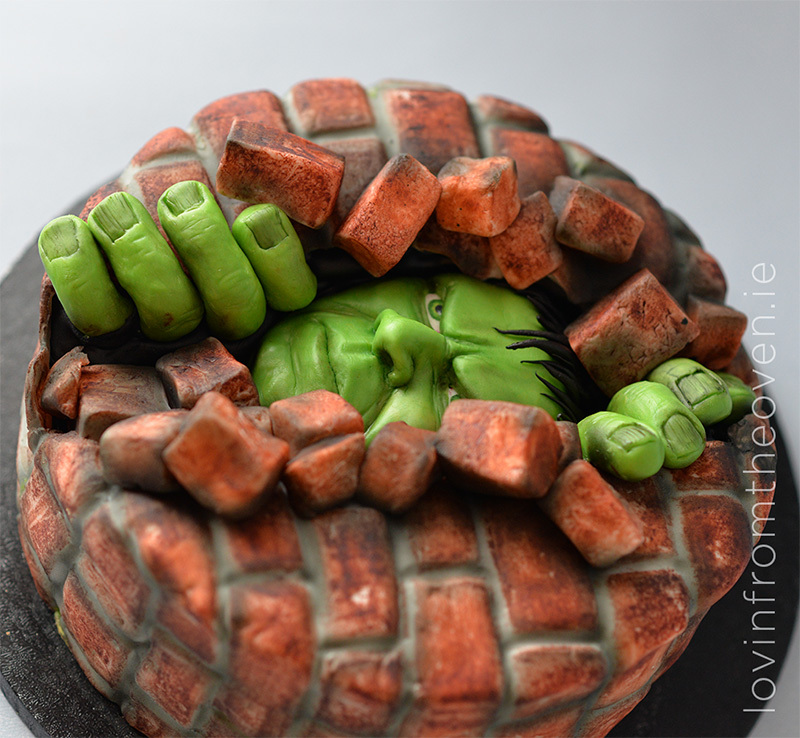 But the wall needed some more ‘exploding’ bricks too. I could have used marshmallows for them but I wanted to make sure that the colours would be the same so I kept with the fondant and just cut out ‘bricks’ and used the same method to texture and dust them. They were still wet enough to stick to the cake when I placed them on. So no edible glue needed. Absolutely amazing,what a work of art ???????? I am a small cottage food baker in San Antonio Texas. 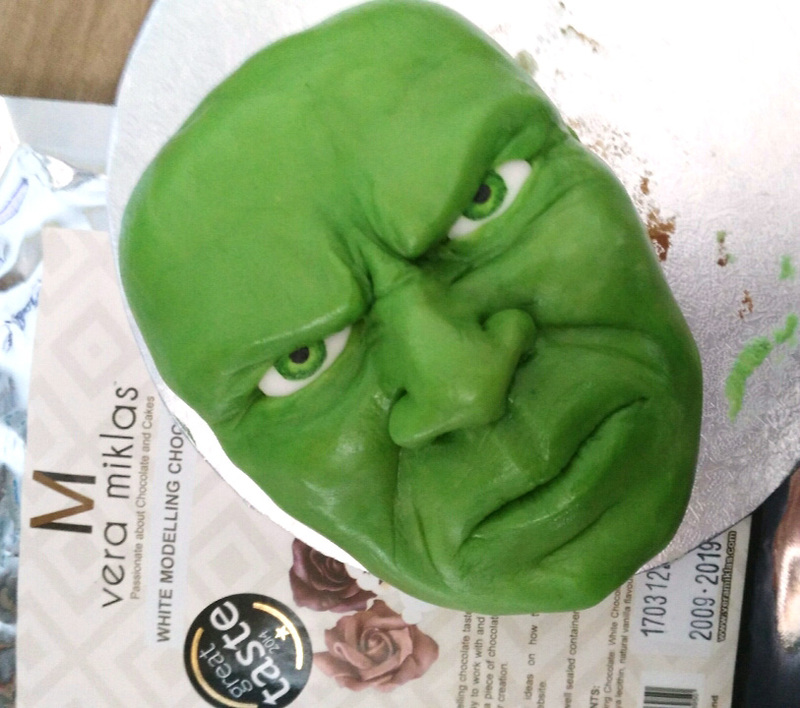 Your cake was sent to me by one of my customers. She wants me to produce it for her grandson’s birthday. How do you feel about that? I’ve had people ask about some of my cakes and I feel honored when they want to duplicate it; however, not everybody agrees with me. If you do not allow an exact duplicate can I eat least use the technique used on the face and maybe do a different color brick? And I am happy to give you credit/inspiration. This is an AMAZING cake!!!! Hi Shelly, I don’t mind at all and love that you’ve asked. Share it back to me though! Would love to see it! Wow! Thanks for the lovely comments Jodi! I’m working on a tutorial for this one at the moment but some other things have come up in the meantime. I’ll get to it soon though. If you’ve made a tutorial I’d love to see it! The hill’s face is amazing! Hi Diane! This one is only available as a class at the moment. I’m not sure where you are in the world but, I am teaching this one in Decobake Clane on September 8th.